Bathing Your Keyboard . . .
Because the Weather Channel forecasted PM Thunderstorms for Conroe yesterday, I didn’t remove the rooftop cover for our front AC unit for the trip over. I had wanted to see if it made any difference in the cooling capacity of the unit while we’re on the road compared to when we’re parked. But when the Weather Channel says ‘PM Thunderstorms, it could be any time between 12:01pm and 11:59pm. So of course it was blue sky and sunny all the way from Columbus to Conroe. The raid didn’t start until about 5pm and then it continued all night and into this morning, with a lot of thunder and lightning along the way. But by the afternoon it had all cleared out. A couple of days ago while we were still at Colorado River TT, I tripped on Karma and dumped about a cup of Diet Green Tea into our nice backlit keyboard. Luckily there was no sugar in the drink which can make a really sticky mess. But I quickly discovered that a number of the keys no longer worked. So it was off to the shower to clean things up. I set our Oxygenics shower head on full blast with hot water and pointed the spray directly into the keys, spending about 5 minutes flushing it out. Next I turned the keyboard over and lightly banged onto a towel on the bed, driving as much of the water out as possible. Then I put it out on the hood of the truck in the afternoon sun for a few hours. And when I brought it back in and plugged it in, it now worked perfectly. I’ve done this for years, washing everything from keyboards and mice to computer motherboards. Thirty years ago when a new keyboard could cost $150, I would clean them out in the dishwasher. First I would run the dishwasher through a cycle without any detergent to clean it out. Then I would put the keyboard in and ran it through another cycle, again without any detergent. Then it was out on the patio for a day in the sun. The client was always amazed that I was able to save their coffee-infused, or in one case, their margarita-flooded keyboard. For dinner tonight Jan got out the slow cooker and started up a batch of Hamburger Vegetable Soup. 8oz. block of Velveeta Cheese – diced up. 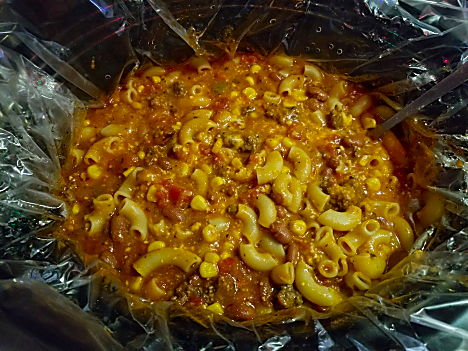 Dump every thing in the slow cooker, except for the macaroni, for about 5 hours on LOW. Cook up the macaroni separately and then stir it into the slow cooker about 10 minutes before serving. Ladle into bowls and top with shredded cheese. Delicious. The precooked hamburger and onions came from our freezer. Periodically we get a 5 to 10 pound log of ground beef from Wal-Mart and then cook it up with some chopped onions in our electric skillet . . . outside on the picnic table. That way there’s no greasy fumes or smell in the rig. Then we divide it up into 1lb. packages and vacuum-seal with our Food Saver. Then into the freezer it goes. Since this was the last package in the freezer, we’ll have to stock up again soon. Tomorrow I’ll probably be slaving over a hot keyboard making corrections to the knife website as updates/changes come in from the client. I totally take back all those times I didn’t want to nap when I was kid.